I wanted to check the demand for a rental service for LSP materials. So I built a small landing page for Germany (see screenshot), tested the demand using Google AdWords and wrote a short entry on Xing. Feedback and demand were good, albeit low in absolute terms. Due to the low number of LSP facilitators also not surprising: As of 2017, there are only about 150 German speaking facilitators, of which about 60 are certified (source: own calculation, member database seriousplaypro.com). Nevertheless, this signal convinced me to buy more LSP material for my own workshops and lend it at the same time. Over time, demand grew. At the end of 2015 Michael Tarnowski spoke to me and we thought about a cooperation for another rental location in Wiesbaden. But at this time I was strongly involved in other projects and not ready for a next level of the LSP rental service. Michael has set up a second rental and I have recommended him for requests that I could not handle at times. Since summer of 2016, I have a little more time again and also facilitate more LSP workshops. LSP does not mean to play with legos. Even if the basic version of the LSP method – some call it LSP 1.0 – is open-source and documented, it takes a training to apply the LSP method correctly. Especially if you want to get from the landscape and scenarios to the simple guiding principles – some call it LSP 2.0. A training that costs 2,000 € to 3,500 € and is essential to apply the method correctly. In order to apply LSP with a team of approx. 8 participants, the investment costs for the material are also quickly increased by up to € 1,800. There are no alternative ways to learn the method and these are difficult to implement because of group dynamics and the hands-on method. The more experience an LSP facilitator has, the easier he or she can ask individual questions and prepare workshops. But how can LSP be easier to practice and how to get first customers? The high flexibility of the method leads to the fact that a wide range of questions can be dealt with. However, this flexibility can also be a disaster, so that in the worst case each workshop must be individually prepared. The standardization of workshops is difficult, but it becomes easier with increasing experience. In addition to the preparation of a workshop or LSP event, the material has to be assembled and brought to the venue. After the workshop, the results, which have hopefully already been recorded during the workshop by means of photos and videos, have to be documented and prepared, so that the use of LSP also has long-term benefits for participants and clients. The material must be sorted again and cleaned after the workshop. With 8 participants, the effort is manageable. But the effort for preparation, execution and follow-up is increasing exponentially according to the number of participants. Not to mention the fact that you often need a co-moderator from 16 participants. Actually, every company or team has complex problems that could be solved with LSP. The awareness of the LEGO brand is a mixed blessing. The playful image of LEGO® makes it easy to misunderstand the SERIOUS PLAY® method. I do not want to conceal that, from time to time, there are rental inquiries from persons or companies who want to “do something with Lego”, think that would burn the LSP method. Such requests are now rejected. Companies that want to work with LSP for the first time should ideally have the first contact to LSP via a trained facilitator. But a top facilitator costs money. This is due to training, material and experience. In particular, as with many other innovation and creativity techniques, the quantification of the benefit is not always easy. Maybe there should be another way which allows the benefits of LSP to be tested quickly and cost-effectively without the LSP ecosystem being harmed. 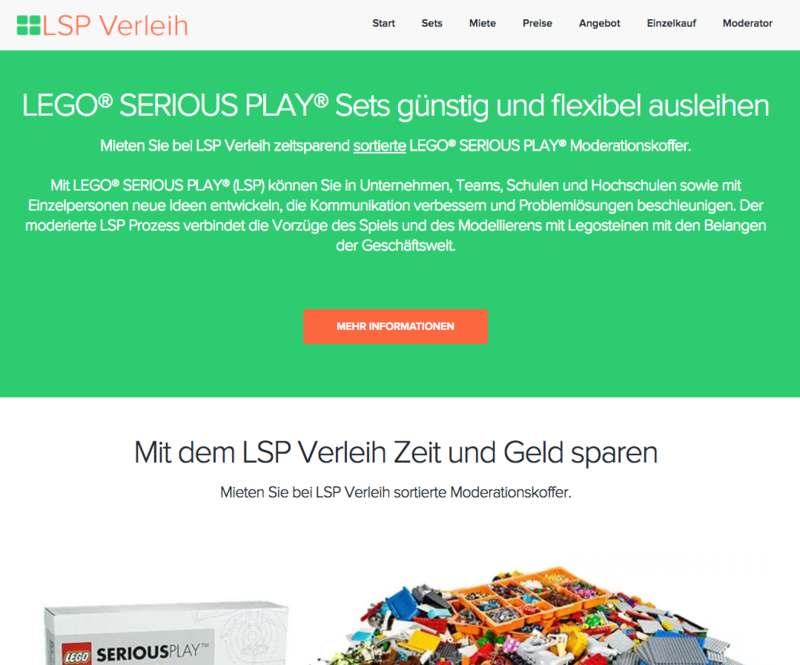 LeanSP is an attempt to address these problems, making the application of LEGO® SERIOUS PLAY® (LSP) easier and spreading the method.